Here is a very quick make with hearts and roses – only 10 mins! 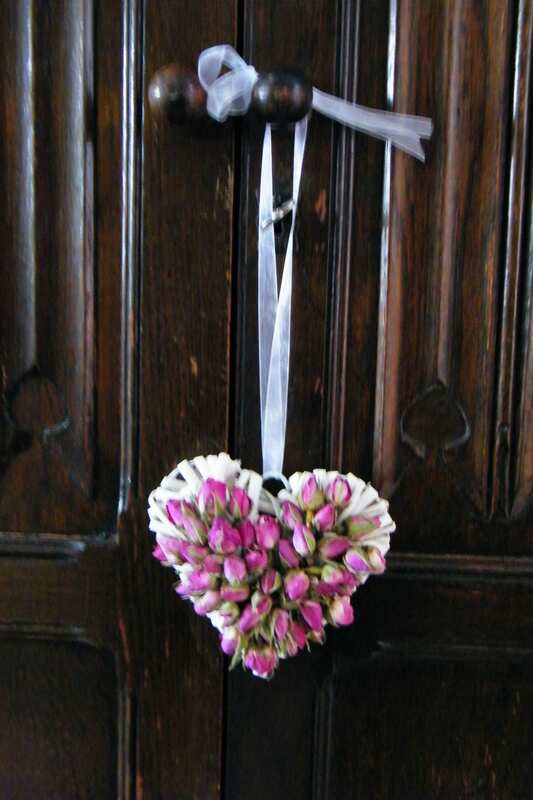 A solid heart wreath – the small criss-cross heart in the image is 13cm across. 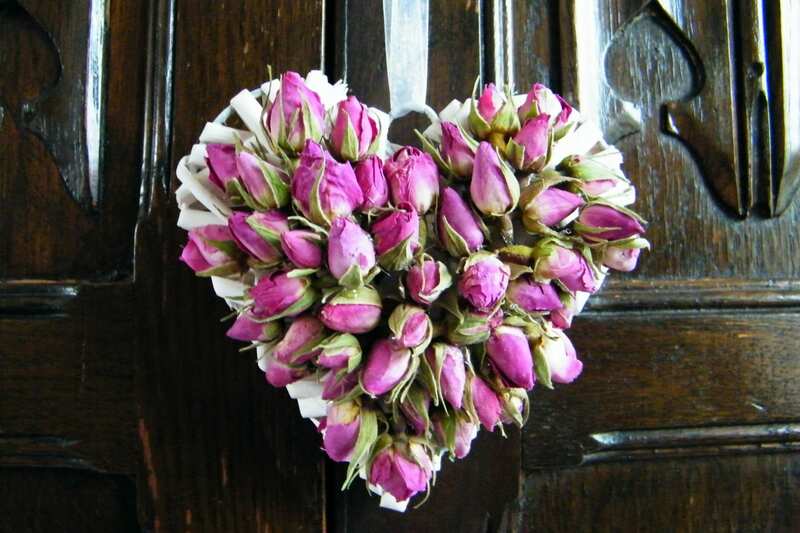 Dried rose buds – I used pale pink rosebuds. Glue (a glue gun is great for this). Stick the rose buds on the front of the heart facing outwards, making an outline. It might look a bit uneven to start with as you have to contend with the different layers of rattan in the wreath. Then glue the remaining dried flower buds inside the outline, all facing outwards, using each new layer to cover any stems or gaps as much as possible. Keep gluing until there is no more space. This heart needed about 50 rose buds – I would recommend buying more than you need so you can cherry pick the best ones. Each of these dried flower buds is about 1cm across. This wreath handily had a ribbon hanging loop already attached, so it was easy to hang on my wardrobe door. Check out other heart wreaths. Although it is possible to buy dried rose buds in various colours, I think this pale pink is by far the best for gluing, as the buds are tighly closed and less fragile than some of the others. 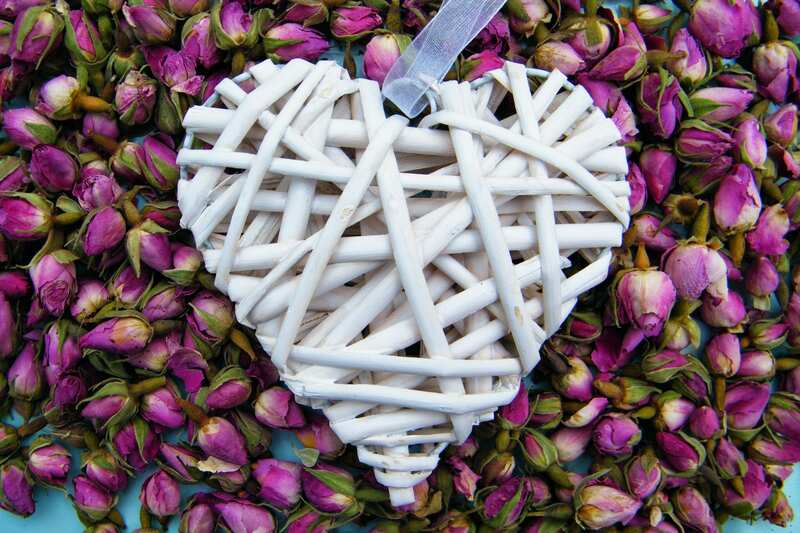 Add a raffia or ribbon bow to your rose bud heart if you like. Add a waft more fragrance to this heart by pouring some Rose Otto home fragrance oil into a small spray bottle and squirting gently onto the dried rose buds whenever you think the scent is fading. [Caution – avoid contact of the oil with polished, painted or synthetic surfaces, keep out of reach of pets and children, may mark textiles]. I used a hot melt glue gun, but if you don’t have one of those you could try hi-tack pva (school glue) – just don’t try and move it until it’s dry.